There are many patients of many different backgrounds. Some need only minor cosmetic services, while others need comprehensive full mouth rehabilitation. These procedures are referred to as full smile reconstruction, where dental function, health and appearance is addressed to create a smile the individual is proud of. 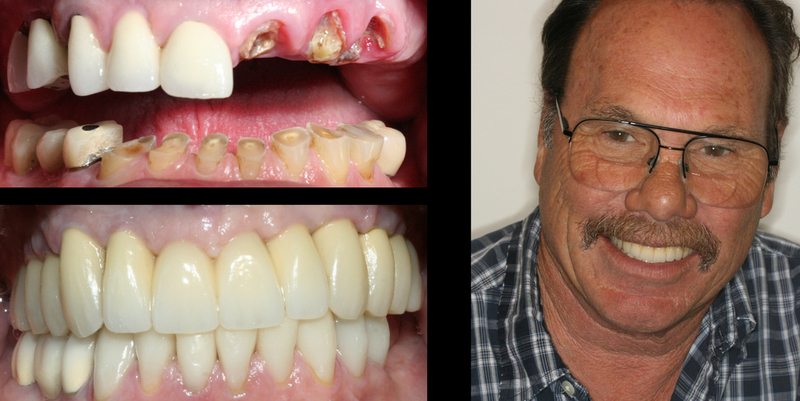 It is absolutely exciting to see a full mouth transformation, not only because it produces a dramatic aesthetic enhancement, but also because the patient’s self-confidence and quality of life also improves in just a few short visits. Whether based out of dental necessity or requested selectively for aesthetic purposes, a full smile makeover has the power to change a patient’s life for the better. When considering full mouth rehabilitation, first visit to consist of a consultation with Dr. Ganesh and the team. Assessment of bite function and malocclusion must be addressed before moving to the restoration stage. By treating malfunctions of the temporomandibular joints and muscles, we relieve chronic symptoms, such as tinnitus, jaw pain and frequent headaches. During restoration, damaged teeth will be repaired: filling in cavities, removing plaque and treating gum infections like gingivitis and periodontitis. The final step uses cosmetic changes to whiten, brighten and reshape the teeth. This may include whitening treatments, placement of crowns or even completely changing the appearance of the teeth using dental implants or porcelain veneers. Each patient’s needs and goals differ vastly to achieve their ideal smile.